Saumya Tandon is an Indian television actress and host. She is currently playing the lead role of Anita bhabi in the comedy series Bhabi Ji Ghar Par Hai! on &TV. She is also known for hosting shows like Dance India Dance, Bournvita Quiz Contest, Entertainment Ki Raat (Season-2) on Colors TV etc. 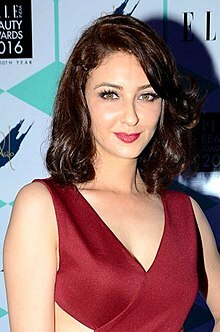 Saumya Tandon took up modelling assignments early in her career and was the "Femina Cover Girl First Runner Up" 2006 She co-hosted Zor Ka Jhatka: Total Wipeout (based on the Wipeout format) with Shah Rukh Khan in 2011. She has hosted Dance India Dance for three seasons, for which she got the Best Anchor award too. She co-hosted Bournvita Quiz Contest, along with Derek O'Brien for three seasons. In Imtiaz Ali's Jab We Met, starring Shahid Kapoor and Kareena Kapoor, she played the role of Kareena's character's sister Roop. She also hosted LG Mallika-e-Kitchen for three seasons. In 2015, Tandon started playing the role of Anita in the comedy serial Bhabhi Ji Ghar Par Hai!. She is also known as "gori mem" from the serial. In 2018, she hosted Entertainment ki Raat Season 2 on Colors TV. Tandon grew up in Ujjain, where she also completed her graduation. We see on TV is that actresses wear the same kind of saris, but the colours keep changing. They look as if they are in a manufacturing unit. However, I have kept my outfits quite distinct from each other. There is no over dressing... I just follow one mantra, "less is more". .
Tandon gave birth to a boy in 2019. Saumya started her career with TV serial Aisa Des Hai Mera and subsequently hosted a number of TV shows. ^ "Happy Birthday Saumya Tandon". TellyChakkar.com. Archived from the original on 24 February 2018. ^ "Saumya Tandon: I will never participate in Bigg Boss as I am a very private person". Hindustan Times. Archived from the original on 24 February 2018. ^ a b "Bhabi Ji Ghar Par Hai actor Saumya Tandon ties the knot". Indianexpress.com. ^ "Did You Know 'Bhabi Ji Ghar Par Hain' Fame Saumya Tandon was a Femina Cover Girl First Runner Up? More Details About Her Inside!". dailybhaskar. 3 February 2018. Retrieved 15 April 2018. ^ "Kushal Punjabi Wins Zor Ka Jhatka". NDTV Movies. 26 February 2011. Archived from the original on 14 July 2011. ^ "Kushal Punjabi wins 'Zor Ka Jhatka' IANS,". The Times of India. 26 February 2011. ^ "Saumya says no to play Geet's sister". The Times of India. 2 February 2011. Retrieved 30 April 2016. ^ a b c "Bhabhiji Ghar Par Hai's Saumya Tandon reveals her diet, fitness and beauty secrets". Hindustan Times. ^ "Hindustan Times e-Paper". hindustantimes.newspaperdirect.com. Retrieved 15 April 2018. ^ "Saumya Tandon: I will never participate in Bigg Boss as I am a very private person". Hindustan Times. ^ "Saumya Tandon: I'm very particular about my look". The Times of India. ^ "Bhabhi Ji Ghar Par Hain actress Saumya Tandon blessed with a baby boy - Times of India". The Times of India. Retrieved 19 January 2019. ^ "मां बनीं TV की 'भाभी जी', सौम्या टंडन ने दिया बेटे को जन्म". www.livehindustan.com (in Hindi). Retrieved 19 January 2019. ^ "Bhabiji Ghar Par Hain Actress Saumya Tandon Blessed with a Baby Boy". News18. Retrieved 19 January 2019. ^ "Bhabiji Ghar Par Hain actor Saumya Tandon welcomes baby boy". The Indian Express. 19 January 2019. Retrieved 19 January 2019. ^ a b "Bhabhi Ji Ghar Par Hai Actress Saumya Tandon". NDTV. 13 Nov 2018. Retrieved 14 March 2018. ^ "New mom Saumya Tandon pens a powerful post on Women's Day". India Today. 8 March 2019. Retrieved 14 March 2019. Wikimedia Commons has media related to Saumya Tandon.